My first video published on tools needed to make soap seems to have been a great success, so here is the next Video Tutorial: Options for Soap Molds. This probably gave me the most frustration when I first started making soap. I was fine with finding the ingredients (though over time I have found better locations and found my favorite products). I was fine with measuring and stirring. I was even ok with handling the lye…because what’s the worst that can happen – burn some skin? The thing I just was not satisfied with was the molds I was using. 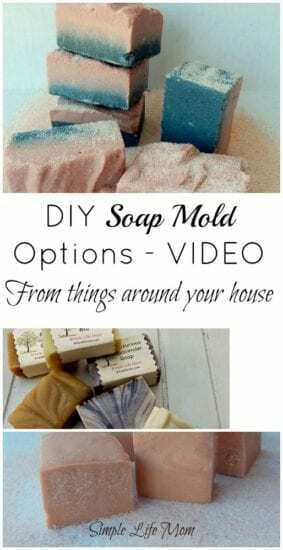 You can definitely buy a mold online or at a craft store that sells soap supplies. You can also find them on Amazon. There are many silicone molds like the one Here and wooden ones like this one Here. I should have the title of the frugal queen (that’s putting it nicely), because I really wanted to use something that was already around the house or something that I could make cheaply. I would love to have a mold where the sides come apart so no lining is necessary (soap doesn’t get stuck), but if you’re going the frugal route that’s out of the question. I tried plastic containers I had around the house, glass dishes, boxes. Each had their problem. Glass is not bendable and so it’s hard to get the soap out. Plastic usually is not square so your soap will be misshapen. Boxes don’t last very long unless it’s a very sturdy cardboard. As for lining, I started using plastic warp but it just rips when you pull it even slightly (plus it leaves giant wrinkle marks no matter how hard you try to smooth it). I tried nothing because I was told you could put the mold in the freezer and the soap would shrink and the soap pop out….didn’t work. Finally, I ended up using parchment paper. I love it and it lines very smoothly. I use it in my wooden mold that I found at the Thrift Store (Yea, thrift stores!!). I give more detail in the video and show option that you can use and give more ideas that you can try. I hope you find it helpful. Please let me know if you have any questions. I love that you found your mold at the thrift store. I am looking to start making my own soap soon. Thanks for the great tips. There are a lot of things that you can find at the thrift store that would work really good as a mold. I just hit the jackpot with my perfectly sized wooden one 🙂 I was so excited!! thank you Kelly for your informative videos, i would be very interested in seeing you actually make the soap, i have put off doing it because it just seems too hard. I have a video being posted tomorrow. Hopefully that will help. After you see that, please let me know if you have any questions. Stopping by from the HomeAcre Hop! This was one of my featured post this week. I have a pile of scrap wood that would work great to make a soap box. I was wondering what the dimensions of yours is. Could you measure it for me?! Love your blog and all the homemade recipes by the way! Just found you a couple weeks ago and am in the process of making several of your recipes. Thanks! I’m so glad that you found us and are finding things you enjoy! The inside dimensions of my long mold are 28″ long, 4-1/4″ wide, 6″ deep. Hi Kelly, I have been making soap for a while, just for the fun and give it away for mother’s day and holidays. My family loves the different soaps. I line my molds with a trash can liner and works great for me. I tried the parchment paper and found to be little too much and also expensive. With a plastic liner, I can just lift the liner or turn the mold upside down and the soap comes out just fine. I made the small wooden mold from scraps sitting in the garage. Each mold gives me about 12 bars. Thanks for the informative website. Enjoy browsing the site. 1 pound batch and it filled it halfway. Next time I will try making a 2 pound batch.